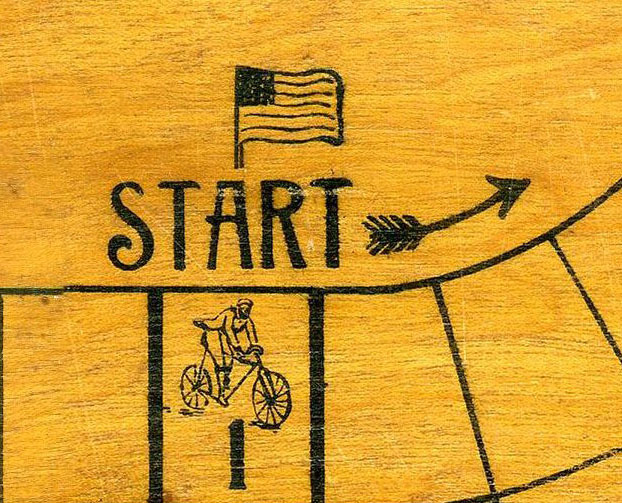 This is a wooden panel measuring 35.5 x 25.5 cms on which a velodrome is printed or silk screened probably by hand. This board belongs to the unpublished games section of the site. I purchased it from Sean Hages from Hamtramck, Michigan, who said that the game came from "a box of stuff from my mother's great grandmother". Of course, this information must be taken with a pinch of salt, not because I doubt from Sean's word but because it is impossible to be sure that the contents of the box have remained untouched all these years unless the box has been locked in a security bank vault. However, my guess is that the game is at least from the 1930s (by "at least" I mean that it may be older, see below), so Sean's story makes sense. I received the game with a pair of old hand-made bone dice, which are probably not related to the game. Of course the inscription "Throw Again" on some squares makes it clear that it is a dice game, though we cannot be sure with how many dice the game was originally played. 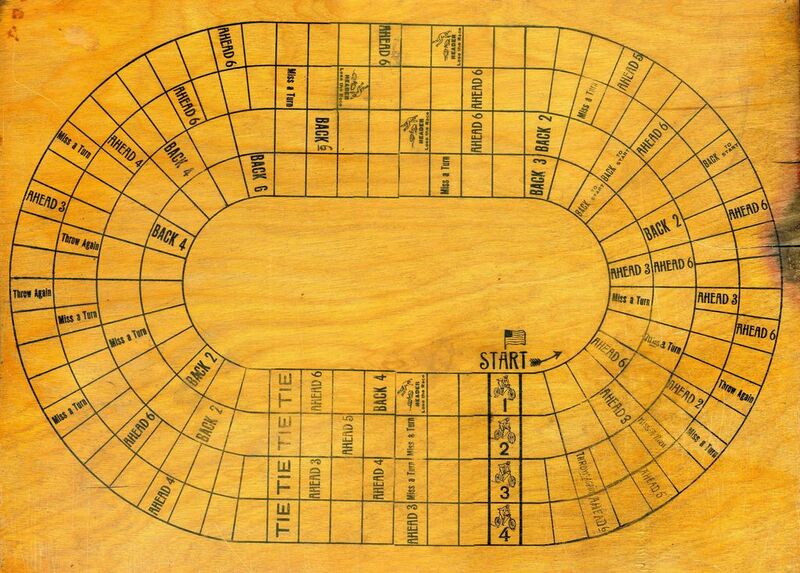 There were no riders or counters included with the game, nor a game box or rule sheet.However, the instructions on the track are pretty straightforward (except for the mysterious "TIE" square which for which I am not able to give an interpretation... any ideas? ), and it is possible that a separate rule sheet was never made. My guess is that this game is part of a very small run (or even maybe one of a kind) made locally by an amateur maker. As you can see, there are four tracks, and since there are no hints of the possibility of changing lanes, we must assume that the riders were placed on the "START" square, and that every rider would run on their own lane until the end of the race (most probably one lap). What is unusual is that the tracks are very unbalanced. The two inner tracks are 40 squares long, while the two outer tracks are 64 squares long. 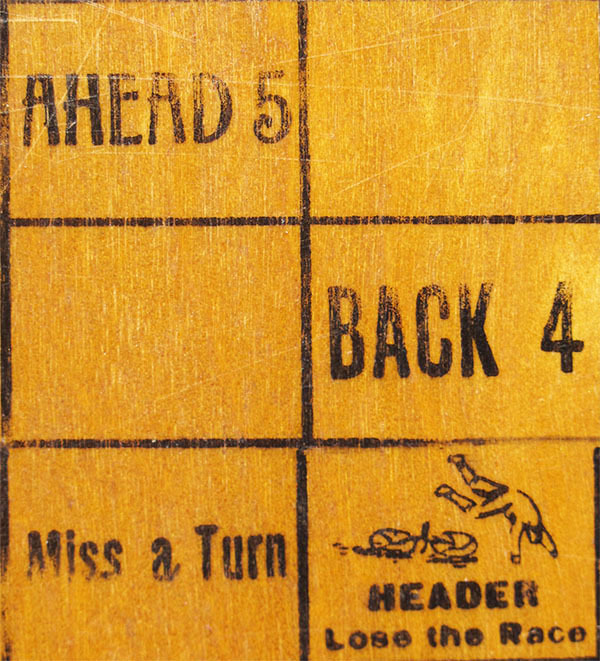 Each track has the mentioned "TIE" and a "HEADER Lose the race" square. Apart from those, the inscriptions on each track are different. One would think that this is meant to balance the race, with the inscriptions on the outer tracks compensating for the extra length of these tracks. Surprisingly, this is not exactly so. This is a heavily unbalanced game, which makes me think that whoever made it was not an expert game maker, and not too good with probability calculations. (By the way, which is the best track depends on whether the game is played with one or two dice. I leave the math up to you). 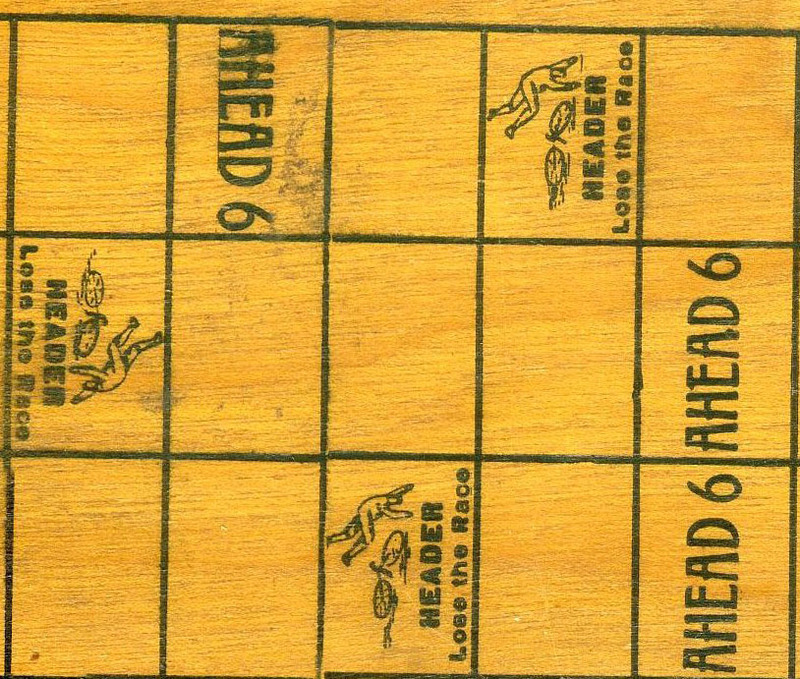 Another weird thing about this game is that the track has been printed or silk screened in two halves, and the instructions in the game squares are counter the sense of the race on the second half of the track. The riders turn anticlockwise on the track, and they find the first instructions in the natural direction of the race (if they were human, and this was a real racing track, they could read the messages) and upside down in the second part of the race. The riders' images on the board, found only on the starting and "header" squares, relate vaguely to turn-of-the-century riders. If we accept that most games, being popular culture artifacts, reproduce contemporary riders, the game could be even older than my first estimation. However, the amateurish production of this game may account for some anachronism. 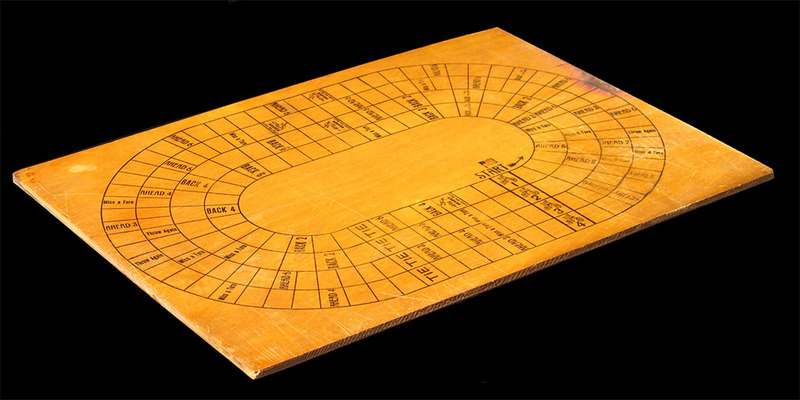 In case you wonder, my 1930's estimation is based on the look-and-feel of the board when I have it in my hands, but I admit this is not the most scientific dating. Thanks Sean for emailing me about the game in the first place, and for selling it to me at a fair price later.